Getting tired of holding your phone/tablet to watch a movie or attend a video conference? Getting frustrated when you need a recipe from your iPad in the kitchen but worry about getting you iPad spilled on? 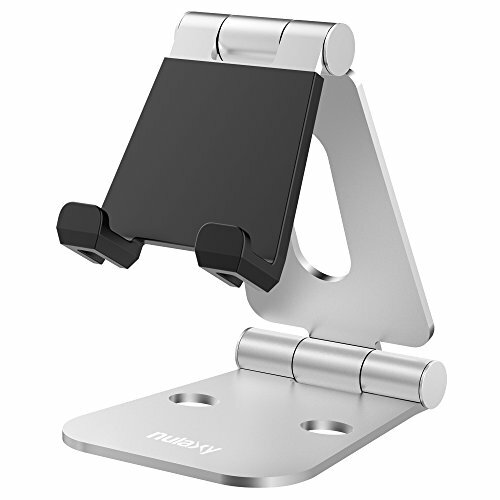 Nulaxy foldable aluminum iPad stand can get you relieved. This newly upgraded Nulaxy foldable aluminum iPad stand is fully foldable which makes it a great space-saver to carry with. You can carry it during business trips, vacations as well as using it at home and office. Adjust the stand to different angles easily and freely to fit your situations and make your devices stay in place. Enjoy the peace-mind while using this stand to hold your devices, since this newly thoughtful designed anti-slip silicone pad will work perfect to protect your devices from daily scratches and sliding. The whole body of this stand is built solid and durable with aerospace aluminum. The elegant and stylish design makes it a one-of-a-kind gadget which will add some new art element to your table. It is compatible with most smartphones and tablets, such as iPhone 6S Plus/6 Plus/6S/6/5S/5/4S/4, iPad Air 2&1, iPad 4/3/2, iPad Mini 4&3&2&1,HTC One A9/M9/M8, LG, Sony, Google Nexus, Motorola Lumia and etc. Get a Nulaxy foldable aluminum stand now, and free your hands and minds.